‘Tis the season to start wish lists.. When I was asked to put together one with my son in mind, I was quite excited! I love shopping for my little boy. At nearly 3, he’s at a fab age of really knowing what he likes and doesn’t like, getting into imaginative play and being a boy, it’s all action and Go Go Go! Being a tom-boy myself growing up, I’m quite looking forward to the years ahead. 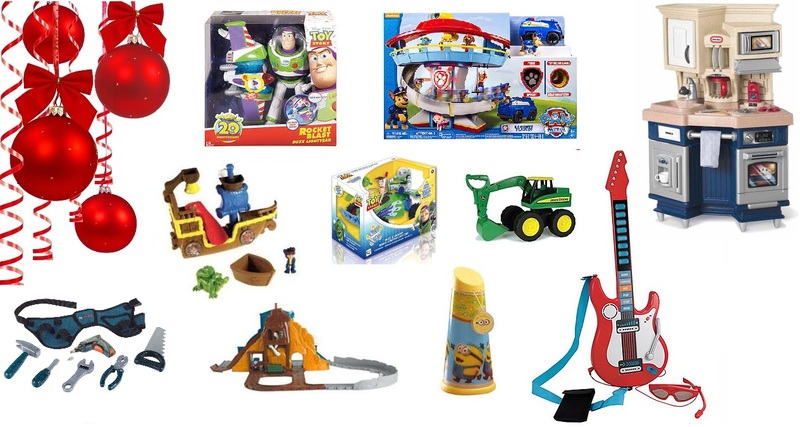 So here we have a wish list/mood board of items from DEBENHAMS that my little boy pointed out as being ‘mine’ while I clicked through the pages of toys..
We don’t watch that much TV, but we live for Netflix, so films are a common watch in our house and Toy Story has become our little boys firm favourite. He’s not fussy, Toy Story 1, 2 or 3 will do. He does own most of the main characters as small figures and they all get taken to bed each evening religiously. However Buzz is one of his favourites, running around the room saying his own version of ‘to infinity and beyond’, so know he’d really love this LARGE TOY STORY BUZZ LIGHTYEAR..
Paw Patrol is a new find/like to him. It took a little while to hit Netflix, but he does enjoy the odd episode and asks for it on sometimes at bedtime. As I said, he’s getting into imaginative play, so this SPIN MASTER LOOK OUT PLAYSET would be great. I’ve deliberated for ages over whether to invest in a play kitchen. Whenever we go somewhere with one he always enjoys playing with it, but I always conclude that it’ll be one of those things that has more excitement to play with elsewhere than if he had one at home to play with every day. I do love the neutral style of this LITTLE TYKES SUPER CHEF KITCHEN one though. Play time continues to bath time and it’s not unusual in our house to find one toy of another bathing or showering with you. Jake and the Neverland Pirates has always been a Disney favourite of our little boys from him being a baby. This FISHER PRICE SPLASHIN BUCKY BATH TOY looks great fun. Woody is his second favourite Toy Story character. He has a couple of remote control toys and loves seeing them go. I’m sure he’d enjoy chasing our dog with this TOY STORY REMOTE CONTROLLED CAR. Living quite rural, tractors are a common occurrence. We even have one that lives down our street! Regardless of what I or the toy box says, I’m sure is my boy could properly talk he’d say something like ‘you can never have too many tractors mummy’. This BRITAINS FIRST JOHN DEERE BIG SCOOP EXCAVATOR would be a great addition to the John Deere collection. We have a BOSCH tool bench, but what happens when your needed on a job elsewhere! Every DIY man needs a tool belt! This BOSCH TOOL BELT would be great for running around the house, least he’d remember where he’d put his drill when trying to help daddy out. Who doesn’t like Thomas The Tank Engine? I recently bought a play table for him to set up his Take & Play track and play trains. This THOMAS AND FRIENDS TAKE AND PLAY DINO RUN set looks fab. So after Toy Story comes Minions, or Despicable Me. We’re not completely obsessed, but he has the odd Minion thing. Preferring to sleep with a light on, this MINIONS GOGLOW TILT TORCH would come in handy for him. Lastly, it’s normally other people that buy the noisy toys for you, but I just loved the guitar and glasses combo of this EARLY LEARNING RED FUN KEY GUITAR. I can imagine him rocking out in the living room! Fancy doing a wish list yourself, with or on behalf of your little person? Get going and you too could win a £100 Debenhams voucher.